A crowd dancing and singing together at the Bakersfield Pride 2018. A warm Saturday evening kicked off with laughter and a sea of color at the 2018 Bakersfield Pride fest on Oct. 13. People were adorned with pride flags draped across their shoulders, dressed colorfully or glammed out in the flashiest dresses and the highest heels. Celebrating Bakersfield Pride’s 15th-year people gathered at Stramler Park, reveling in the company of friends, family, and fellow LGBTQ members. Tyler Moore (far left), 17, marching around the pride and holding up a “STR8 AS A Rainbow” sign. 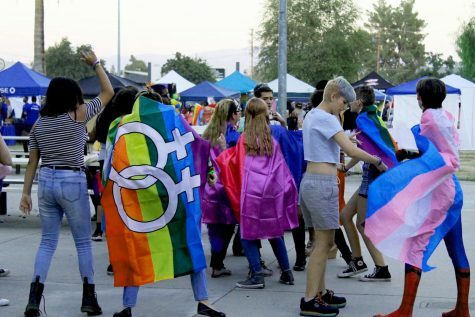 Hosted by Bakersfield LGBTQ, they presented festival goers with drag shows, an assortment of booths and vendors, and live music, that lasted throughout the day. Booths like the Bakersfield Pride message board were set up near the entrance of Stramler Park to greet people coming in. Local vendors sold handmade jewelry and colorful shirts alongside churches and companies like St. Paul’s Episcopal Church, United Church of Christ, AERA, and T-Mobile. 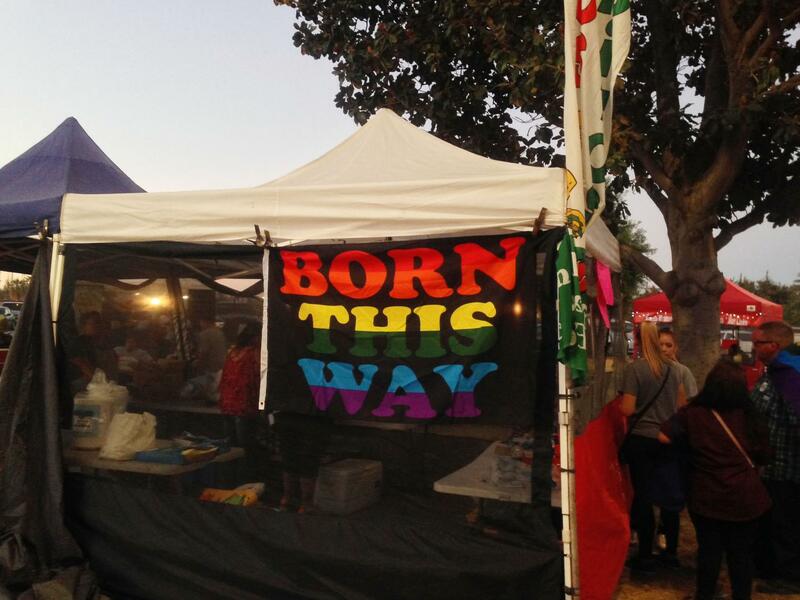 Other notable booths were the SoCal ACLU, the Center for Sexuality and Gender Diversity, Bakersfield College’s Sexuality and Gender Acceptance Club (SAGA), and the Kern County Public Health Department. Attendees like Juan Contreras and Benji Shiell found plenty of meaning in Bakersfield Pride. Contreras described it as a place of support, and that it shows nobody is alone no matter the circumstances they’re in. 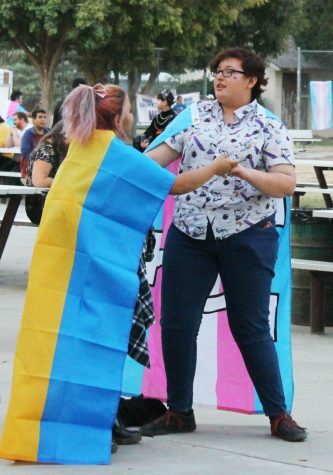 Ethan Mil (right) and Guadalupe Tapia (left) dancing together with transgender and pansexual pride flags. 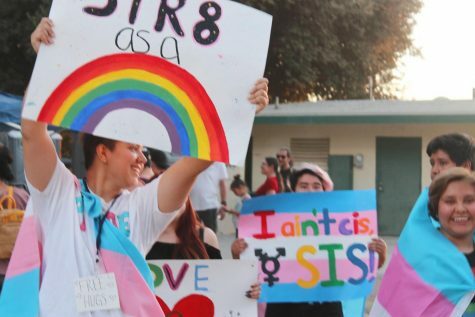 “[The] Bakersfield Pride event means a lot because it not only means acceptance, it also provides awareness…information, and resources for those who do not know [about them] or do not know where to find these said resources,” Contreras said. Shiell finds that the Bakersfield Pride is meaningful to her because it is a place for everyone to be themselves and hang out with friends. She sees the event as a chance for people to come together and get to know one another. Bakersfield LGBTQ started in 2004 by a small group of people who wanted to see more community advocacy and events. Today, that community has grown significantly. When asked to describe the Bakersfield LGBTQ community, Contreras described it as a very friendly and positive community. He said that there are many people within the community willing to lend a helpful hand to those in need. Bakersfield Pride celebrates its 15th Pride.